Karachi, a thriving port city, a sprawling metropolis that is showing no signs of arrest in population growth. It already houses a population of 23.5 million, a number that nearly equals the entire population of Australia. No wonder the city is called mini –Pakistan. The metropolis faces many problems like crime, politically sanctioned gangs, dearth of mass transport and shortage of power. However a more serious threat to its implosion is the issue of water shortage. Water is the juice of life. The very surprising fact that population has grown exponentially over the years despite water scarcity entails within it some grim details. Recently a investigative program (Unreported World) by a foreign media group highlighted the plight of people living in Karachi’s slums. A huge populace lives day by day and collection of water is a routine anxiety. A significant portion of their everyday life gets consumed in chasing what many would take for granted in a metropolis. It was ironic that Pakistan’s own media which is extremely independent and often borders on yellow journalism failed to highlight the issue with as much attention as it demanded. There have been citizens rising up to the task but their voices have been muffled by the collusion of water mafia and politicians. Karachi’s current water supply is under the steely grip of the water tanker mafia. The city has twelve hydrants where water is available but given the size of the city this number amounts to droplets in an ocean. Although it is illegal, but the main water lines have been deliberately ruptured in many places both by ordinary citizens and mafia to tap into the main supply artery. This has increased the control and sales of water in private hands. The stealing of water means those at the living downstream hardly ever get a trickle from the main supply line. Unfortunately rampant corruption in Karachi’s water board has exacerbated the problem. The upper strata of the society routinely purchases bottled drinking water and tankers to fill up their private underground tanks. The more impoverished rely on boiling the little amount of mains water they receive or use alum treatment. Those who cannot even afford the later, drink untreated water from any available source and are prone to a variety of water borne diseases including hepatitis. Unfortunately, this last group constitutes the majority of Karachi-ites. Even in 1998, the Pakistan’s own metrology department highlighted that Karachi will be prone to civil war because of water shortage by the year 2010. For now the civil war situation has been kept at bay mainly by people’s own ad hoc solution. Where possible many residents have dug their yards and tapped into aquifers. 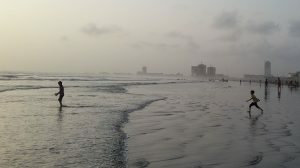 Karachi is a coastal city and underground water is often brackish. Although this water is not used for drinking but is used for washing and cleaning, easing to a certain degree the shortage of supply. With the effects of climate change no more a theory but a stark reality, Karachi felt the brunt of global warming in 2015 with an uncharacteristic heat wave that saw hundreds perish. It is predicted that the heat wave will strike again in the summer of 2016. It is well known that water consumption goes up with heat, putting the citizens of Karachi once again at the crosshair. This trend is likely to continue as global temperatures rise. The current supply comes from Kenjhar lake (fed by the Indus river) and Hub Dam. The supply from Kenjhar Lake amounts to 583 Million Gallons a Day (MGD) and from Hub amounts to 100 MGD. If the current trend of population rise continues, the demand in 2015 that stood at 1130 MGD is expected to rise by a further 200 MGD by the year 2020. The only positive aspect of the shortage of supply is that it has made citizens conscious of wastage. It should be noted that average consumption of water by a Karachi-ite is less than 20 gallons a day (taking losses into account at 30%). Compared to other megacities where the average consumption is around 80-100 gallons a day, Karachi is extremely prudent in its water usage. More recently the links to the reservoir of Haleji , that had historically supplied water to Karachi (during the British Raj) are being revived. This reservoir will be able to add 65 MGD to the city mains. In oil rich middle-east, purification of water by desalination is a common place. Oil is used during the process and the costs can reach 0.45 to 1 USD for one cubic meter (1000 liters) of water. Most families in Karachi are paying 8 times that price. It was in 1993 that an Engineer, Akhtar Iqbal Zuberi from Karachi’s premier Engineering institution (NED university of Engineering and Technology), designed a desalination tower, that produced fresh water free of cost. The plant ran on solar energy alone. The height in the tower configuration increased the temperature of vapour and accelerates the evaporation procedure. To this day, this design stands the most efficient in terms of clean water output to energy ratio. It is unfortunate that this well designed indigenous solution was shelved. There have been numerous cost effective desalination projects carried out by the same university, all designs are unfortunately gathering dust in NED’s repository. The plant designed by Zuberi provided 40 liters of clean water per meter square area per day. This is at least ten (10) times more productive than a conventional Horizontal Solar desalination plant. Water desalinated from this plant had the purity of 16 parts per million (ppm). This water is much cleaner compared to US mains water which has a salt level of 500 PPM. If supplemented by auxiliary power such as gas, the plant can produce much higher quantities of water at an extremely low cost. It should be noted that Karachi already receives an average of 5.44 kWh/m2 of solar insolation per day, that is one of the highest among the cities of its scale. If the local government is willing to take the initiative, a fund can be made and money could be pooled from the donations made by the industrialists. The hybrid desalination towers (part gas-powered part solar-powered) should be constructed mainly along the accessible coast line of Karachi. These will add to the existing hydrants and can also inject water into the mains. Using gas heating in conjunction with Solar energy will also improve the security of supply. Along the coast of Karachi are the populous towns of Korangi and Saddar. The coastline is also in reach of less densely populated Clifton, Manora and Bin Qasim towns. It is estimated that Hybrid Solar Desalination towers erected along these coastal towns could serve almost 20% of the population of Karachi. It is important to mention that the cheapest way to source fresh water is to build reservoirs. However such reservoirs are long term projects whereas as hybrid solar desalination solution will yield fresh water in lesser time and the solution is also scalable. If long term sustainability is the goal than desalination must be supplemented with a conservation drive to further reduce wastage of water where applicable. Previous articleHow Students from South Asia can Prepare Themselves for Studies Abroad?